The performance of a company is largely dependent on the efforts of its employees. If the employees are inspired and energetic then this positivity is going to reflect in the work which they submit. Employees are the very backbone of the company and if they do not feel passionate about what they are doing, then this could mean hell for the company. Owing to today’s stressful work environment, various employees suffer a burnout even at the peak of their career. As a manager it is important that you prevent such employee burnout. Here are some of the main ways to prevent it. Many managers or bosses are unable to deal with the employee burnout because they do not know the causes of it. There are primarily three causes of an employee burnout. The first cause is due to personal reasons where it is usually pessimists, perfectionists and even over achievers who experience burnouts due to the unrealistic expectations they have from themselves and their lives. Secondly, an employee’s inability to balance things on the personal and professional front causes this burn out. Finally work related stress is another chief cause for burnouts in employees. As a manager in the company your primary duty is to look into the well being of those who work for you. Your work force is only as good as you make it. It is your primary function to unite your employees and make them work as one comprehensive unit so that no one feels left out at any point in time. So be a manager who is like a friend to the employees. Only have your door open so that they can walk in and vent whenever they are feeling low and bowed down. Offer advice to the best of your ability and continue to be positive in your outlook. Encourage them and tell them that no matter what things will get better. If you want your company to do well, it is important to invest in the right tools and devices such as the employees can work properly. Employees feel most frustrated when the computers or technology which has been given to them does not work or function properly. Such frustration and anger is one of the primary reasons for a burnout. So ensure that your office has a quick internet connection and all the tools which the employees need to make use of are well serviced, top of the line and suiting their purpose. If not, things which would otherwise take a few minutes will take a number of hours. It is often said that all work and no play makes Jack a dumb boy and if you keep giving your employees work without allowing them to take a break then that is certainly going to cause a burnout. Having some stress busters in the office is a very helpful thing indeed. Things like having an office pet, a gym where the employees can work out or even a nice television room is perfect to help the employees cool down and relax when under tremendous pressure. In addition to this, to prevent burnouts, ensure that your employees take regular vacations so that they can refresh themselves. As mentioned above, a boss must always be available to lend a ear to his employees and to hear them out in the event of them being in some kind of distress. Yet, as the head of the company you might always have the time to do so and in addition to this employees might feel a little awkward to come up and speak to you, about maybe a personal issue or a problem which they are experiencing at home. Having a psychiatrist in the office is very useful as these professionals will know exactly what to tell someone, who is experiencing or is on the verge of experiencing a burnout. When employees start working at a company, they are usually very fresh and bursting with vitality. Yet very often it happens that over time these energy levels go down and they gradually start experiencing a burnout. A major reason why they do experience this is because they might feel like no matter what they do, they are never able to get any positive feedback and none of their work is ever praise worthy. So to prevent such an employee burnout, always ensure that you praise your employees where it is due so that they are encouraged to do their best at all times. In addition to giving credit where it is due, it is equally important that all the employees feel like they are an important part of the company. When the company is facing any problem, be sure to share it with the employees so that they know what is going on and they feel like they actually do belong. No matter what position you have in the company, there is no need to act high handed at any point in time. Employees should be treated with respect and they should be valued for all the time and dedicated service which they are giving to the company. Creating a positive work environment goes a long way in ensuring that the employees will not experience a burnout. You must ensure that at all costs everyone is working as a team and there is no one who is bossing over another person, making him or her feel threatened. Having a competitive work environment is a good thing, yet ensure that there is no cut throat competition between the employees. Having a negative work environment takes a serious toll on the employees where they look for excuses to stay away from the office as there is too much pressure and foul play at work. All employees work hard so that they can get promotions. Promotions are things which should be given out after careful weighing and measuring. Giving promotions to unworthy candidates often creates a lot of ill will in the heart of the other employees. To prevent such a burnout, where employees just give up hope, ensure that only those who deserve receive the honor of being promoted. If possible have exams which everyone has to take to ensure that the process is absolutely transparent and that no one can feel bad or hurt because of the conclusion which has been arrived at. Each manager or boss has their own way of overlooking the work which the employees submit. Some bosses choose to leave the employees to work according to their own way whereas on the other hand there are those bosses who think that micromanaging the employees is the ideal thing to do. Very often it happens that this micromanaging and constantly breathing down the neck of the employees is a source of great frustration and irritation to the employees causing them to experience a burnout. You must ensure that you let the employees know that you trust them and are willing to let them make a few mistakes. Every one of the employees in a company has their own strengths and weaknesses. As a boss it is your responsibility to ensure that you get to know each employee and find out what their strengths and weaknesses are. It is based on this knowledge that you should allot tasks to each of the employees. Make it a point to play on the strength of an employee when giving him a project to take care of. Communication is a two way street. As mentioned above, it is important to let the employees know that they can always come to you when they are experiencing some kind of worry or distress. In addition to this, ensure that you too are talking to the employees asking them questions and generally scanning the surroundings to ensure that things are okay. Very often you can prevent an employee burnout by simply showing that you care for your employees and asking them how things are. If you know that things are not going well for them at home, do try and cut them some slack. One of the chief things which cause an employee burnout is when certain employees are placed on a pedestal and they have unrealistic expectations to live up to. Placing someone on a pedestal does not simply become a source of pressure for that employee but other employees to try and achieve the unachievable. So do give praise when the need does arise but do not make any employee your favorite at any cost. Treat everyone the same and remember to maintain your professional distance. Rather than having any unnecessary problems to deal with, doing this things is actually the best. Burnouts are often because when employees are not challenged enough. It is monotony that brings about this burnout in their mind where they are unable to think in an unconventional way or come up with out of the box ideas. Be sure to throw challenges to your employees and constantly encourage them by saying that you have faith in them. When they realize that you are encouraging them to take the leap then they will never experience this burnout rather they will be constantly trying to live up to your expectations and this encouragement will bring out the best in them. Throwing challenges at your employees is good as it forces them to think and come up with new ideas. Yet this having been stated, ensure that in the attempt of trying to bring out the best in them that you do not put too much pressure on them, pressure that they will be unable to deal with and consequently cause them to experience a burnout. Throw challenges which you genuinely believe they can achieve and do not expect them to work like robots for you. Over working employees will cost you and the company in the long run. Lastly, it is very important to ensure that your employees are inspired. A burnout takes place when the employees are unable to tackle with things no matter how much they are trying. So as a manager make it a point to have workshops and courses where the employees can constantly learn new things and be up to date with the various developments in the field. This little effort on your part is bound to help them a great deal. If you notice that an employee is experiencing a burnout then it is important to seek professional help as this could lead to further complications. 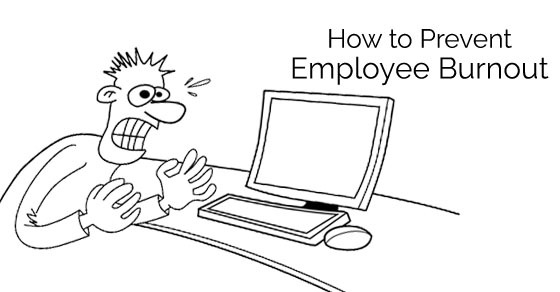 It is easy to prevent employee burnout provided you know how to deal with this issue. The more you are sensitive to the needs of your employees and recognize their individual qualities, strengths and weaknesses the better you will be able to have a positive and optimistic work force that are able to handle anything that comes their way. Turning a blind eye to your employees is only going to make matters even worse. Keeping employees happy is the secret to the success of any company.